I went to see a doctor yesterday. I didn’t feel well. I felt a little feverish. I had a headache, a stuffy nose, and no appetite. The doctor said I had a cold and prescribed me some medicine. Having a cold is bad enough, but it could have been worse. Thank God it’s not the flu. 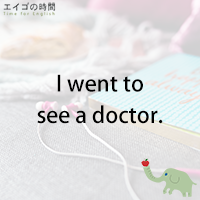 Now, let’s look at this expression “see a doctor” or “go see a doctor”. You may wonder why I don’t say “go to the hospital”. In English, you don’t say you go to the hospital unless you are badly injured in a car accident or you need to have surgery. When you don’t feel well or you think you’ve caught a cold, you don’t go to the hospital, you go see a doctor. I didn’t go to the hospital. I went to see a doctor.